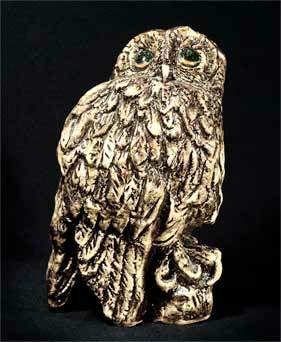 Paula Humphris tawny owl - 11¾" (298 mm) high. 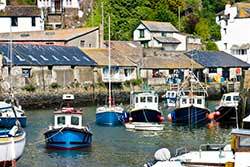 Polperro is a quaint, picturesque fishing village on the North Cornish coast very close to the Devon border. In the 18th century its economy was sustained by smuggling and fishing but by the following century, due to the efforts of the hated revenue men, was confined to fishing. Large quantities of pilchards were landed and processed by three pilchard factories on the quay. The 19th century also saw the arrival of many artists, visitors and photographers. Paula Humphis, born in Oxford but with Cornish familly connections, moved her pottery to Polperro in 1969. She had started it earlier in that decade when, after training for four years at Birmingham College of Art, she married and moved to the Cotswolds to work as a schoolteacher. She is best known for her hand painted tin-glazed majolica figures but she has also made stoneware hand built pots. Her work was sold locally and at two of London's top stores, Liberty's and Harrod's. Paula's pottery was twice destroyed by flood; once in 1976 and again in 1993. After the second flood she decided to close it, and now lives in mid-Cornwall letting out the Polperro cottage during the summer holiday season.